We have each been sick with mild cold symptoms this past month. Very thankful it doesn’t seem to progress very far. We now have a Honeywell QuietClean running at all times and having healthy kids makes me feel good. I believe that our new purifier is one of the reasons we don’t get sick often! The makers of Honeywell have partnered with a team of environmental health scientists to release a list of the top 10 most common VOCs found in American households along with an online checklist to help with remediation. It really opens to your eyes to what is out there floating in our air! There are a number of simple steps that can be taken to help reduce VOCs in the home. 1) Choosing products (including cleaning, household goods, etc.) that release fewer VOCs. 2) Increasing ventilation, particularly when products containing chemicals are used. 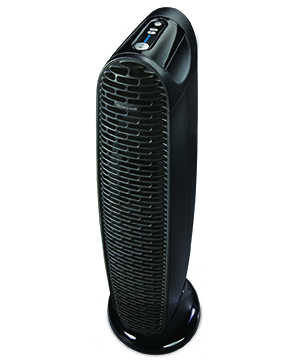 3) Using a portable air purifier that includes a carbon filter as part of the filtration process, helping to adsorb VOCs which leads me to show you the Honeywell QuietClean Tower Air Purifier. Quiet (really is!) air purifier with permanent (yes you don’t have to keep buying! Just rinse!) pre-filter for medium rooms up to 186 square feet. Electronic filter check indicator for easy maintenance. The light will tell you when to clean! Captures dust, pollen, cat dander and tobacco smoke. Especially great for people with allergy and asthma issues, but I believe it keeps us all much healthier! Sleek size makes it convenient and hide-able. I have ours between a shelf and counter and no one even notices it is there. Energy Star rated and certified which is super important to us! Do you think about the air in your home? Do you have a purifier? I partnered with Honeywell for this product. All opinions are my own. The giveaway will end on Jan. 11, 2016 at midnight MT. Winners will be drawn via widget. Once a winner is drawn I will contact them and they will have 48 hours to reply before I draw a new winner. Giveaway is open to anyone in the US and you must be 18 years of age or older. Giveaway not affiliated with Facebook & I release them of liability. Winner will be posted in the widget. I've used air purifiers before and I hope I can win this for my family. Yes I have and they do help! This one is nice! We do not have an air purifier, but we are looking for one, since one of our kids was diagnosed with asthma. I've never used one before but I know we could use one! Yes, they definitely make a big difference, especially if you have a lot of allergies and sinus problems. This one seems really nice. My neighbor has one and her house always smells so clean. We have a chihuahua and my house always smells like dog to me. This would help so much. Thanks for the chance. I have not used an air purifier before but would love to try one! I have never used an purifier before. My allergies seem to get worse, the older I get. maybe this would help. I have never used an air purifier as yet. I have one in my room (a honeywell), and love it - I'd love to have another one for my living area!! I have not used one before.. I would love this because I have a dog that sheds like crazy. No, I haven't used an air purifier before. I have environmental allergies now, so would like to see if having one would be beneficial. I haven't tried an air purifier, but I've been wanting to. I have not used an air purifier. I would love to try one. My mother lives with me and she is a heavy smoker. She smokes outside on the porch but the smoke still manages to come in the house. I've never used an air purifier before, but would like to see how it would work in my living room. I have used an air purifier and I do believe it makes a big difference. I've never used one before, but I do believe they can help. I have never used one before, but I was thinking about trying one out. I've never used one before but I think I would make a difference in our bedroom. I have not used an air purifier before but would like to try one....so I need to win! We did use one constantly, and it worked wonders for the air quality. Alas...it did not survive all the moves we've made the past few years. I would love to win one! Yes, we have used a Sharpier Image air cleaner for years and it does make a difference. But our old air cleaner is running on it's last leg. Yes, we had 2 from Sharper Image years ago and used them for years and years until they died, they pulled so much filth out of the air, loved them. I bought an air purifier from Eden Pure several years ago. It did not do a good job. I have never used an air purifer before but would love to try one. Using our a/c almost year round I think it would be a great help with allergies and things our family has. Thanks! i have never ever owned or used an air purifier so this would be amazing to win. My mother would benefit from this. I have read good reviews about the Honeywell Air Purifiers and would like to try one. Betcha my allergies would get better! I have never personally used an air purifier, but my parents have and it really made a difference. I would love to have one to try. I love air purifiers. Have never used the Honeywell brand but would love to try one! We used to have an air purifier, but nothing like this one. Sounds really nice! I never used an air purifier before but I would love too! No I have never used an air purfier, but I know my family needs one! I've never used an air purifier but after reading the review on this one it makes me think it will help my son with his allergies. He's constantly getting sick and then ear infections. I'm going to call the doctor to see if this could aid him. I think it will. I would really like to try one of these, I never had before, but my husband has allergies. I never used one before. I'm sure my apartment could use one. I've never used an air purifier, but would love to try this product. I think that air purifiers are great. I had one at my last house, and I could totally tell that the air was easier to breath when it was one. I've never used one before but need to for my cousin. I have not used one before but I have heard of how it is beneifcial. I have an older home and a child with allergies so I would love to check one out to see how beneifical it would be for us. I have a Febreze air purifier I use near the cat little box to help keep the dust down. It works great! I've never used one but would love to try this out! I have never used an air purifier before, but have considered purchasing one. I can't really say if the one we used did any good or not. We bought a small one years ago when they came out. We never really noticed a difference but I think it was way to small for the area. I haven't used one but I would like to. I haven't used an air purifier, but I have used a Honeywell fan. I do think Honeywell is a great product. I would use this in the spring time when I start painting a couple of rooms to help get rid of the paint fumes. Thanks for this wonderful giveaway! I have used an air purifier in the past and definitely noticed positive results! The unit that I had is no longer working; I sure could use a nice new one like this :) Thanks for this chance! I am sure that the new technology has made these air purifiers work better. I have never used a air purifier before but would like to. I have not used an air purifier but would love to try this one! It looks amazing! I havent used an air purifier but I really want to! Everyone in my house has asthma and we tend to get sick often with my husband bringing everything home from work. (He works in a hospital) I think an air purifier would help us so much! I have been wanting to try an air purifier for my daughter who has asthma. We have one now and we notice the difference. We'd love one for our baby's room! Yes, I have used an air purifier and I noticed that there was less dust. It also helped with getting the smell of cigarettes out of the air. I have not used an air purifier yet but would love to try one out with having pets in the home we could use one. I could really use this with all the allergies I have and on top of that I have Asthma! This would be great for my home! I've been using an air purifier since 1990. My allergist said this would help make the air more breathable for me. It definitely makes a difference, meaning less sneezing, eyes watering, and nose running. I have bought several through the years. Honeywell is definitely the best. I haven't tried this particular one. We could definitely use an air purifier now that we're using our fireplace more often! Ive never used one but I wonder if it would help with allergies. i really need a new one of theses. The model i have is older and this would be great! I have never used one before, but I would love to experience the difference! I've got an air purifier and it really helps with dust and my allergies. Now I could just use one for my bedroom! I used to have an air purifier when I was younger and it made a HUGE difference for my allergies! Would love to have one again, thanks for the chance and happy almost New Years! I haven't used one but would love it for my son! I really want this, with allergies around here by 3 different people in the house, this would be great!! Would also be great for when I get bronchitis!! This would be so good to have!! I have used an air purifier before. I could tell a big difference in the air quality. I haven't had an air purifier but I sure do want one. No I have not, but I do have seasonal allergies and hope this might help. I do not have an air purifier. My adult daughter has one and says it helps immensely with allergies. I haven't but with pets in the house I think this would really help my son's and my allergies. We have allergies that bother us year round. I have never used an air purifier before. I haven't used an air purifier before. Yes we use one in our bedroom and living area! I really need one for the kitchen area! We could really use one. I worry about the air in our house. My husband works on cars and there are constant fumes going. Plus, we have allergies so it would be nice to freshen and clean the air. I have never used an air purifier. I'd love to try it. Thank you! I have not used an air purifier. I would like one for my son to help with his allergies. I've never had one, but I really want to try one. With a large smelly dog and two cats, plus a mold thing happening in our basement, I need one! I have grand children with many allergies. They really need this. I have never used an air purifier and think it would help in my house ALOT since we have two short haired dogs. We used one years ago and really noticed a difference! Yes, I have and it definitely makes a difference. Oh my I sure could use this with all my allergies and I get bronchitis once a year it makes it really hard to breath this would really help in my home and my husband smokes. I would love to win this for my son that has asthma. I had an air purifier in my bedroom and really liked it until it quit working. I could tell it really helped with my allergies. Would be nice to have, house is always dusty and our birds don't help. We would love to have one of these. I suffer from allergies and my husband can never get a good night's sleep. I think an air purifier would make a huge difference for us. I have never tried an air purifier, but would love to try it! Thanks for the chance! I have never used one but we need one in our house. Yes, I have and I do feel it does make a difference. I use one in my house daily -- in fact it needs to be replaced. Both my husband and daughter suffer from allergies and it helps them tremendously!! No I have not used an air purifier. I haven't used a air purifier before. I have had Honeywell products before and have always been very happy with quality! I had one for a very short time before I accidentally dropped it and broke it. So I'm not sure if it made a difference or not. I'd love to try again! I've never used an air purifier but would love one. I have 2 cats and have allergies, sniffling all the time. I haven't had one before but I would like to try one. I have seasonal allergies and perhaps it will help. No , I haven't use a air purifier. But would love to try one. I have not used an air purifier, but my parents do and it has made a huge difference for them! I have not used an air purifier before, but would love to try one out as my husband and oldest son have bad allergies. I ask santa for one of these and I didnt get it!! uugghh!!! We have a small one, similar to this. It makes a huge difference. We need another to cover our entire house. We used to live in a basemet apartment and it was essential! We still like using one in our sleeping area, I would love one for the main living area too. Would love to win this, Need for my musty apartment. Yes I have used one before and they make a big difference here in the dusty SoCal desert. This would sure help my late in life allergies.. Yes, we had one when we lived in a cabin with a fireplace & woodstove for heat; the Air purifier was truly essential. I do not have an air purifier however my sister does. When I visited her she had one in my bedroom and I slept so well and awoke clear headed not congested. It helps with my asthma. I have used one before but it was a smaller model and older and not sure it works well. I have not used an air purifier, but I really need to try one to help with my allergies!! Our son uses one and it helps is breathing. I think about the air in our home because our son has allergies. I have never used an air purifier before and would love to. I have COPD and my grandchildren have asthma and I think this would help us out so much... It would give us such a more healthier environment to live in. Never had an air purifier before, but could use one w/ a small pet in the house! I have always wanted to get an air purifier but never have. We have pets and all f us have allergies. I am sure we would benefit from one. I have used an air purifier before in my bedroom. I share my bedroom with 2 birds, 2 guinea pigs and my house bunny... And my 3 dogs also sleep in my bedroom at night. :) I could definitely tell a difference when I was using it. I haven't used an air purifier before, but am hoping to win this one so I can try it out in my house. I have not used an air purifier before but I am anxious to try one since I have kids with allergies, I would love to see if this offers some relief for them. I haven't use one but really want one! I have used an air purifier before and regret that I dont have it now to use. I've never used a air purifier and have always wanted to. It's just having the extra funds to buy one. I've never used an air purifier but we have a lot of dust in our house and I think a purifier would make a big difference. I've never used an air purifier before but my allergies have been aweful all year round since baby #2 & could use some relief! I need an air purifier I have dogs and birds and we use a wood stove in the winter. I think they do help keep pollen levels down. my hustband has severe copd....i'm hoping an air purifier will improve our air quality and thus, his quality of life! I have pretty severe allergies, so we've been using air purifiers and notice a difference. Our last one conked out and we haven't replaced it yet. This one looks great. I have used an air purifier. I think it makes a real difference in air quality. 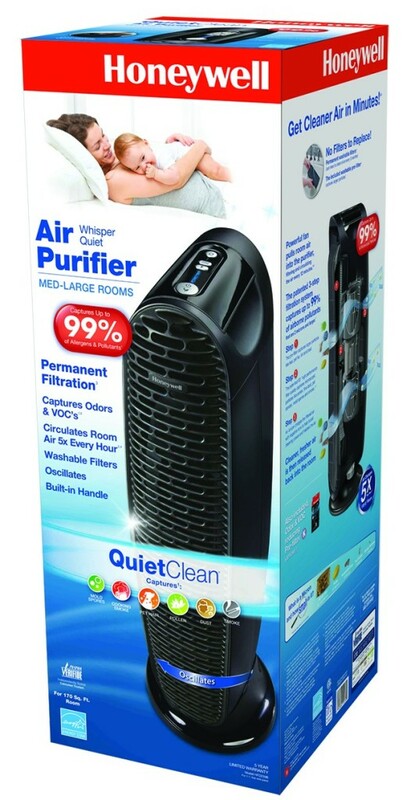 I have used an air purifier and they help with allergies,sinuses and clean the air. My brother has asthma and uses an air purifier to help him breathe better. He says it makes an incredible difference and it's definitely true. My husband and son have allergies so I would love to have one in my home too! I have used a small inexpensive air purifier before, but I think it was too small for the area and didn't help as much as I was wanting it to. No I have not, but I would like to try one to help with my allergies. I've never tried an air purifier, but would like to try one. I've never used an air purifier at home, but I really would love to!! We never had an air purifier yet! Love air purifiers....ours is on it's way out the door because we've used it daily. I'd love to win a new one - thanks for the chance!! Yes, I have used one before. It made a noticeable difference. I never used an air purifier before. I haven't tried one yet. Read many good comments so am looking forward to using one. thanks for the chance. We had one years ago and it really did seem to make a difference! I have not used an air purifier before but would love to:) thanks for the chance! I have used an air purifier before and noticed a difference. I have asthma and the air purifier seemed to lessen my attacks. I have a Honeywell air purifier that I use in my bedroom 24x7. I would love another one for the family room. Thanks for the opportunity! Yes it made a difference and purifiers should come standard built into duct work. Hi I use to see air purifiers that were over 600.00 dollars. this would be so useful in our bedroom. Highly recommend it!!! I haven't ever used an air purifier but I sure would love to have one. I have an air purifier in the living room. I would love to have one in the bedroom. I have terrible allergies and have to take clarinex and flonase daily. I think the air filter helps. I own 2 air purifiers! Not Honeywell brand though :( I love them and have my family using them as well in their homes. My daughter is Asthmatic and this helps so so much with dust! I've never used one, but I've heard they do work! Would love to try this...thanks for the chance!! I used to have an air purifier a few years ago but unfortunately it quit and I was unable to replace it. I would love to have one again especially since my family suffers with allergies year round!! Thanks for the chance and Happy New Year!! Haven't used an air purifier, but have always thought it would be great to have! My air cleaner is beginning to Before to noisey to run. We use it daily. I've never used an air purifier before. Never used a purifier before. I have never tried an air purifier but only have two windows in the largest area of my home. I have two cats and a toddler, I'm sure the air could definitely be cleaner. I haven't tried an air purifier before but would love too. Especially with three kids I really want to reduce their exposure to VOCs. Thanks for the chance to win. I have been wanting a purifier for some time - maybe I can win one? I have it was wonderful. I noticed I breathed better with one! I haven't used one before; I've been thinking about getting one to help with my family's allergies. I have not had an air purifier before but I would love to try one. We have used lots of them. They definately work as the filters are alwas filth when we take them out! I haven't ever used one but have always wanted one to see if it would help with my daughter's Asthma! I would love to win the Honeywell air purifier because I suffer from allergies all year long. I have not used one before, but think it would be great for my daughter's asthma. I think an air purifier does make a difference. We also use them for white noise in kids rooms. Could really use one of these in our house! I have never used an air purifier and would love to have a chance to try this Honeywell. I haven't used one before, but as a person with year-round allergies, I'd love to have one. I use air purifiers bc of allergies. Makes a difference! I have not used one before. But would love to experience the difference. Yes, we have. We tried the sharper image ones a while back. They worked well, but were recalled due to over production of ozone. SIgh.. I've never been able to use one of these, but very much looking forward to the opportunity to win one so that I can! We have three children and two dogs in the home. We've been looking into air purifiers for some time now and I hear very good things about this brand! Thank you for the opportunity! I don't have my own air purifier but I have been at someones house that had one and yes you can tell the difference. I haven't, but I could really use ones with my allergies. Having 4 kids , 2 dogs and 1 cat means of course I've used an air purifier i have no option ;) and yes i think it really helps . Yes, I have used an air cleaner before and really liked it. Unfortunately, it's not working too well now. It did work for a few years though. No, I've not, but I really could use one with all of the allergens floating around! I have used one before and they are great to have. This would be great to have again. I have never used an air purifier; however, I have heard good things about them and would love to try one. I have never tried an air purifier, but would really love to try one for my family! I have used Honeywell's smaller boxed air purifier and they are amazing. The filters collect so much dust etc that I was really impressed with how well it worked. I would love to have this larger one for the living room. Thank you! I haven't used one, but I think it would help a lot during allergy season. I never have, but I've heard they are helpful. We haven't used one but I would like one! No, I have not used one. But I think it would be helpful for my daughters and mine allergies. I use one in the basement and it works well. It is very old and noisy but would love have a clean fresh one for my home. I would want it my son has a heart transplant and to keep the air clean is so important. No, I don't have one, but would love to have one for my 9 year old who has severe allergies and takes weekly allergy shots. I've never used an air purifier but I have been in the market for one since I've found out my son is allergic to almost everything it seems. It would be great to win one! Thanks for the chance! I have never used one but my husband has breathing problems and this may help him. I have never used an air purifier but think one would be very helpful in reducing some of my son's allergies. The Honeywell Quietclean sounds like great product. No I haven't used an air purifier before but would like to try one to see if it helps during allergy season. I have used an air humidifer before and noticed better sleep with it. I haven't, but since I have a son with Asthma I'd love to try it and see how well it works for him. No I have never used an Air Purifier before. I have had Asthma since I was in my 20's, and last year was diagnosed with COPD. So I have been thinking about getting something like this to see if it works or not. Air filters DO make a difference and I need to get one. i have never used these before, but i heard from people that they work great ! I haven't use one but I really need one. I have bad allergies and this would help. I have a new three month old grandson that I am keeping in my home everyday while his parents work and I could really use an air purifier. I live in a high allergen area and have tried an air purifier. It is OK but I need something specifically for the bedroom to allow better sleep. I have never tried an air purifer, but I'm sure I could use one. I had one about a decade ago, and it seemed to work well in my home. I would love to get another, as I have children now, two of whom have bad allergies. We have one in my son's room and it really cuts down on his allergies. I would love to have another for our bedroom! I haven’t tried an air purifier, but I think it would help with my allergies. We have one in our living room now and love it. Would love to have one to put upstairs. They really make a difference in the air quality. I would love to win the Honeywell Air Purifier. No, we've never used one before but I'd like to. I have never used an air purifier. I never used one before but my Aunt has one and keeps talking and talking about how great it is. I think I would like one for my place. I've never used an air purifier. However, I have some chronic respiratory issues that don't respond well to medication, so I'm kind of on my own as far as treatment goes, and I've been wondering if using an air purifier might help ease my symptoms. Thanks for this chance to win a nice one! I haven't used an air purifier but I've always wanted one. I'm sure it would make a big difference. I have never used an air purifier. I really need one! I haven't used one before, but my parents have one and it seems to really help her allergies. I have never used an air purifier but I have been wanting to try one. No, I have not used an air purifier before. I know that Honeywell is a trusted name in products and would love to try this air purifier to help my allergy symptoms. I haven’t used an air purifier but I’ve always wanted one. I have not used an air purifier before, but I would love to own one to see if it helps with allergies. I never used one of theses would like to win. Never used one would love to win. I haven't yet used an air purifier, but would like to! I have never used an air purifier and would love to try this! I have never used an air purifier, but as someone who owns several pets, I have a feeling we could use one. Yes I have used one and noticed a difference. I would love to have this for my son's room. I haven’t yet used an air purifier, yet, but would love to. I think would help on the quality of the air in the house. Need to try it. Thanks for the opportunity! I have not used an air purifier before, but would love to try one out for my daughter. She has terrible allergies, especially in the Spring, and I think this would help her. I've had one small table top air purifier. I think it made a difference when we very first got it but I don't think the difference lasted long since we didn't replace the filters.. lol I'd love to have this for the main part of my 70s home. Lord knows what kind of crap is in the air in here. I have thought about getting one since my son has asthma. I have never used an air purifier before but have heard it is highly recommended and I am dying to give one a try. I have used an air purifier before and it worked good. I would love to win this for my daughter for my Grandson's bedroom. I have never used one but would love to! I have never used an air purifier, would love to win so that I can compare the difference, especially with my granddaughters visits. I have an old one and have not noticed anything, but this looks great and that it could! I had an air purifier but I broke it. They are little magical machines. The kids don't sneeze as much when it's on. I originally bought it when I was pregnant with my daughter to get the smell of food out of the air. I had hyperemesis and the lingering smell of food in the air would drive me over the edge. Count me in to win! I have used an air purifier before and they do make a difference! I have not used one before, but would love to see what a difference it would make. I used one years ago when my daughter was a child, I loved it! Now I would love to share this for my granddaughter! I used to have an air purifier in my bedroom years ago and I really missed it because it did make a difference with my allergy and sinus problems! I have used an air purifier in the past and was surprised at how dirty the filter became in a matter of days. I use an air purifier in my sons room, I think it really makes a difference. I have not used an air purifier before but would like to. I have used an air purifier. They do make a big difference. I have not, but I would love to see if it does make a difference. I did own one briefly, and I did notice a difference! It gave me some peace of mind, too, to think that think that pollutants from my cleaning solutions were being removed. I have never had an air purifier, but I would like to have one to try. Thanks for the contest. I have never used one in my own home however my sister has one and loves it! I have used an air purifier before and yes I do notice a lot of difference, less dust and cleaner smelling air. I have never used an air purifier before. I have heard and seen great reviews and experiences from others. I really want one mainly for my newborn but for all of us as well. My newborn has problems with stuffy nose and she breathes in all the lint amd particles flying around our apartment. I cam see them through my phones camera as i go to take pictures. Its crazy nasty. It would be a blessing to win this as my husband said we are never buying am air purifier which made me sad. I've never used one but would love to. I've had a stuffy head for 4 months....wonder if this would help. I have never had an air purifier but found out that my son is allergic to dust and this would help. I have never had an air purifier before and would love to own one. With 5 cats, are you kidding about an air purifier?! THANK YOU SO MUCH! Beyond grateful!!! An air purifier is very important to purify the air and clean your home air. Specially if someone at your home have allergies then try to have an air purifier and in that case you can try Honeywell QuietClean Tower Air Purifier.